What is Shimano S-R Concept? Introduction: Two years ago Shimano pushed the envelope in spinning refinement when they first introduced S-Concept. Today S-Concept reels are not limited to the most expensive offerings, and S-Concept features can even be found on sub 80 dollar reels like the Symetre. This season Shimano further enhances their spinning reel design with the brand new S-R concept. We take a look at exactly what S-R Concept is, and what this new design truly means for anglers. S-R Concept: S-R concept is already a reality, and the new Stella FB is the first, and only reel in the US, to make full use of the new concept. With the Stella series, �you have a product that once you use it, you won�t be able to go back to using anything else,� states Jeremy Sweet with Shimano�s product development staff. �We�ve taken Stella one step higher � the best getting even better � by incorporating our �R-Concept� features in these four new reels to come up with what Shimano calls the SR-Concept.� The new SR concept has all the aspects of Shimano's existing S-Concept (Smooth, Silent, Strong) and adds R Concept, which stands for "reliance." Shimano states that the result of the new SR-Concept means that "dreams in reel design are now evolving into a reality." 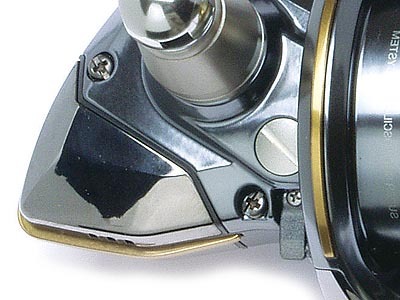 SR features are designed to improve reliability, refinement, and ruggedness to the company's premium spinning reels. The major features of SR concept are: SR-3D Gear, Rigid Support & All Weather Drag, SR Guard Fins, SR Handle, and the SR One-Piece bail. 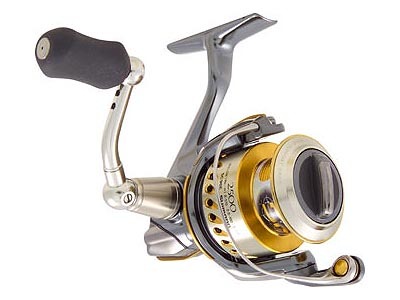 SR-3D Gear & Handle: The Stella FA already made use of enhanced drive and pinion gears so rather than modify the materials Shimano sought to build a reel with even tighter tolerances. What the engineers at Shimano came up with was SR-3D Gear, an oversized drive gear that was designed with "three dimensional analysis." This made it possible to contour the surface of each tooth to exactly the shape of the pinion gear. The SR Handle then screws directly into the drive gear so there is absolutely no play between the handle and the reel's main gearing. What does this mean for anglers? : Because there is reduced spacing between the drive gear tooth surface with the pinion gear surface there is maximum contact between gears resulting in a smoother retrieve, and increased torque response. 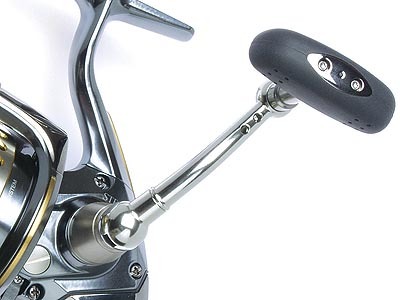 The SR handles for the 1000 sized reels will feature a thin solid shank, while larger reels will use a hollow handle shank, either way Shimano reduces weight while still maintaining a strong and reliable handle. SR Rigid Support & All Weather Drag: The SR-Concept features a rigid support drag and an all weather drag. The All Weather Drag uses a water proof gasket to keep water out of the natural wool drag system, making it perfect for a wider range of conditions. What does this mean for anglers? : The rigid support drag will reduce spool wobble even at the lightest drag settings. This will result in smoother more constant drag performance even when at very light settings. The all weather drag will improve performance in both fresh and saltwater applications, and wool drags provide a exceptional range of settings, low start up inertia, and fantastic durability. The current Stella FB reels have 48 points per turn of adjustability! SR One Piece Bail: The SR one piece bail is a good example of just how far Shimano is willing to go in their quest for supreme refinement. The Sustain and Stella FA make use of a sculpted bail design, but new SR reels will feature a one piece bail with absolutely no gap in the bail. What does this mean for anglers? : The stainless steel one piece bail eliminates the possibility of line ever snagging up in the gap between the teardrop and the bail wire. The reduced friction allows line to drop into the roller quicker, improving line management. SR Guard Fins: Would you drive an exotic car without bumpers? Shimano wants to help protect your investment with SR Guard Fins. These fins are effectively bumpers for your reel, acting as a buffer between the reel's critical edges and harsh surfaces. SR guard fins are coated with titanium and strategically placed on several parts of the reel's body and the rotor. What does this mean for anglers? : The SR Guard Fins help protect SR-Concept reels from impact damage. 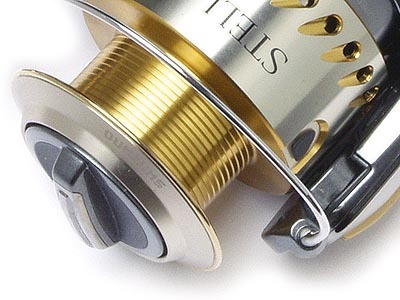 This clever feature provides additional protection to your reel from scratches when the reel is laying down on the deck of the boat, or when anglers stow their outfits while shore fishing. In addition to providing defense from collision the fins are also aesthetically pleasing. Conclusion: The R-Concept add-ons to the existing array of S-Concept features makes for an exceedingly refined total combination. This new SR concept design philosophy introduces a number of highly advanced new-fangled features into spinning reel design that continue to push the envelope. While the SR features are an evolution in the design process, they do offer anglers increased performance, superior durability, and unprecedented refinement. 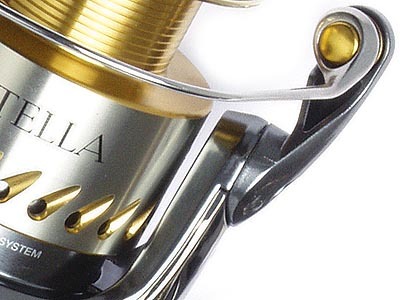 Currently here in the U.S. if you desire to fish a domestic SR Concept reel your only option is the premium priced Stella FB. History has revealed that Shimano is very good about bringing proven technologies down through the lineup, and we sure hope they will do the same with the very alluring new SR Concept features.